Short leather whip with a high quality stainless steel handgrip. This whip is simply a must have. Nice to take with you inside the pocket of your jacket, no matter where you go. The handgrip is only sixteen cm. Did you know that all NLLeather whips are a Dutch design? length grip 6,3 inch (16 cm), 24 threads of 8,7 inches (22 cm). 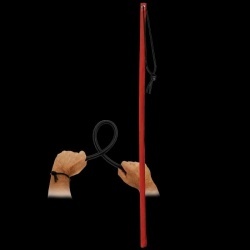 Acht Rattan Cane Bundel met Paars Handvat van Mae-toys Een bundel 6mm dunne rondhoutjes voor een serieuze afstraffing. Onze rattan canes zijn natuurlijk afgewerkt. 23.5"/60cm totale lengte. Deze cane heeft een stevig handvat, afgewerkt in nepleer met een lanyard.